A few weeks back, Reliance Jio released a new app under its portfolio which was found to be a unique offering given the features it allowed. 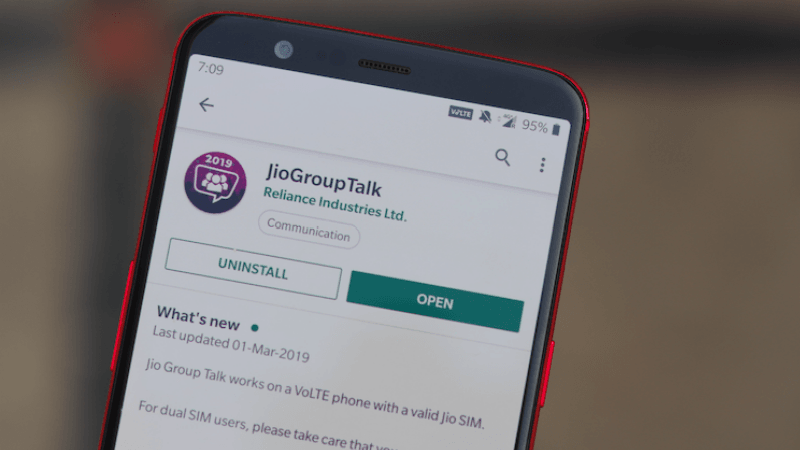 Reliance Jio launched the Jio GroupTalk app which is a specific platform for users to connect easily in a conference call. It is worth noting that currently, the Jio GroupTalk app remains in a trial or beta stage and it has only been put out for this purpose. Even then, if you would like to test the application to see whether or not it increases the quality and ease of conference calls, you can do so without hindrance on Android and iOS. We decided to do just that to see how the Jio GroupTalk app fares when it comes to conference calls. How to Start with Jio GroupTalk? Jio subscribers who want to try out Reliance Jio GroupTalk should note that the app requires a phone with VoLTE to run and it won’t function on the phone with Wi-Fi only. You will be required to have a Jio SIM inside the device with the VoLTE turned on for the app to work properly. Download the application on your device, sign in using the login credentials and allow necessary permissions. Upon doing this, you will receive an OTP on your registered number to verify. Enter the OTP, and you will now be ready to make conference calls over the app. Do make a note that you should be on your Jio 4G internet connection to log into the application, otherwise, the app will display an error. To make your first conference call on the Jio GroupTalk app, you can tap on the ‘New Conference Call’ button under the Recent tab. From here, you will be able to select the contacts you want to dial, and then you can hit the call button towards the bottom of the screen to initiate the conference call. Reliance Jio GroupTalk also enables you to form a group first and then call the group at once, thus connecting all the members of the group in one swift call. Also, you should keep in mind that the app currently allows a maximum of ten contacts to join conference calls. It is also worth noting that the app informs that it can be used to call the users who are the not using the Jio GroupTalk app, meaning that it should also be usable to connect non-Jio users to conference calls. However, we found that the Jio GroupTalk app could not place calls to non-Jio numbers. It is entirely possible that this was because of the testing phase of the app. Also, Reliance Jio’s GroupTalk app offers a unique feature to the participants of the conference call named as ‘Lecture Mode’. This mode mutes the other participants except one who can then address the other much like in a class. You can turn on the Lecture Mode on the Reliance Jio GroupTalk app by pressing the mute button on the top-right corner of the ‘Manage Call’ screen. Because of the beta phase of the app, there are also a handful of features which are currently not working. Some of these include the ‘Schedule Group Call’ feature. Also, the app currently requires the user to save the contact before they are able to dial it up. However, it would be convenient for users to dial the number directly. Overall, it can be easily said that Reliance Jio GroupTalk is one of its kind app in the market right now and it does well on what it is supposed to do. Also because the app allows you to connect with as much as ten people on a call at once, that too including landline numbers, makes it an impressive offering from Jio. Jio Group Talk connects to all service providers, not only Jio. that too including landline numbers, — you mean landline number from JIO can also be connected? Yes you can call any Jio or non-Jio number using JioGroupTalk. Only condition is that your calling (source) number should be Jio. However, we found that the Jio GroupTalk app could not place calls to non-Jio numbers.